Fried food is tasty. Its salty, fatty, crunchy coating is extremely satisfying when we are hungry. It reminds us of home, family, and friends. It is easy, simple, and cheap. I wish I could tell you that fried food is good for your heart or that it will help you to lose weight, but this is not the case. Frying food is one of the most unhealthy food preparation methods. When fried, food absorbs fat. This increases the amount of fat and calories that we consume when we eat fried food. Furthermore, foods that are fried are also very salty or high in sodium. Salt is typically added after frying to give foods their characteristic taste. Eating a lot of fried foods can have negative effects on our bodies and can promote obesity, diabetes, heart disease, and cancer. A healthier method of cooking is baking. Baking requires little to no added fat therefore limits the amount of fat and calories that we consume when we eat baked foods. Less salt is also used in this food preparation method. For example, a 6-ounce serving of fried shrimp has about 25.8 grams of fat, 470 calories, and 1500 milligrams of sodium while a 6-ounce serving of baked shrimp has about 4 grams of fat, 220 calories, and 310 milligrams of sodium. It is clear that baking foods is healthier than frying foods as baking leads to foods lower in fat, calories, and sodium. Consuming less fried food can help us all to lead healthier lives with less disease. It is easy, bake don’t fry. Preheat the oven to 450 degrees. Wash and cut the sweet potatoes into sticks. Try to make all of the sticks equal size to promote even baking. In a large mixing bowl, toss uncooked sweet potato sticks with cornstarch until all of the sticks are evenly coated with cornstarch. Add oil and seasonings, and mix until each sweet potato stick is coated with oil and seasonings. 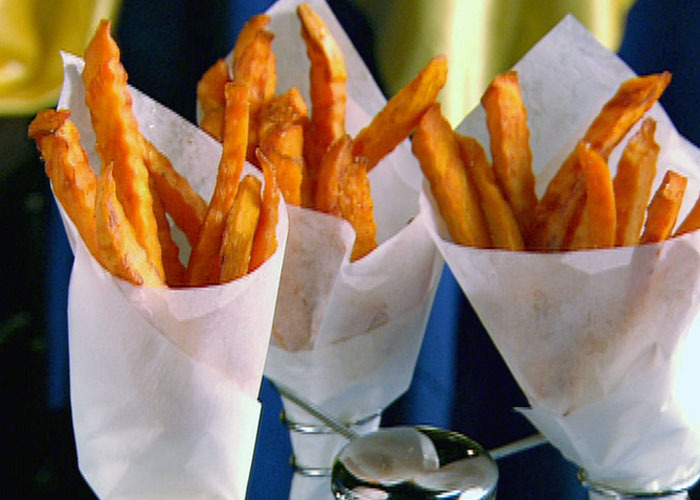 Place seasoned sweet potato sticks onto a nonstick baking sheet in a single layer. Do NOT overcrowd the baking sheet, as the fries will be not become crisp. Bake for 15 minutes, then flip. Bake for an additional 10 to 15 minutes until fries are crispy and golden brown. Entry filed under: Uncategorized. Tags: bake, calories, Fat, fry, sodium, sweet potato.